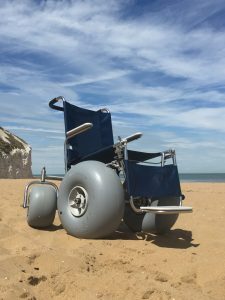 This is our fantastic new De-Bug wheelchair that you will be seeing on the beaches in 2017 and beyond. It’s a different design to our previous wheelchair the Landeez and we hope you will find this chair much easier to use. The local community, businesses, organisations and charities have all been very supportive of us over the last 12 months in particular and their efforts have seen enough money raised to replace 7 of our Landeez wheelchairs initially, with more to follow in the coming months.